Before I left on my expedition to the South Pole I got a lot of advice from people. 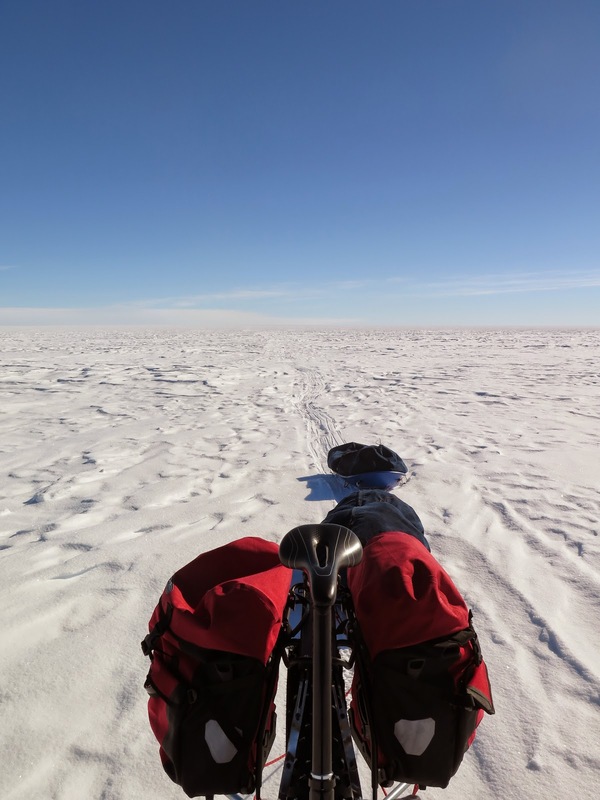 Biking to the South Pole is a seemingly impossible task. I assume these people were honestly concerned about my welfare. This is part five of nine posts looking at some of the advice I was given. endless track left by my bike and sleds. at you can see Juan's ski tracks. My wife accused me of jumping off a cliff and then half way down trying to figure out how I am going to land. The reality is I did not go into this cluelessly. In Antarctica I was alone and had to rely on myself to solve any problems that came up. I knew this before I left. The planning and preparing for the expedition were not taken lightly. Even my wife did not understand all that I put into getting ready. The thing is, NOBODY had ever done this before, so nobody knew what it would take. I got a lot of great information from studying other expeditions. I talked a lot with people from Antarctic Logistics and Expeditions. They knew what it took to do an expedition by ski. Tim and Mike from ALE came to my bike store, Epic Biking. We talked in depth about the expedition and what it would take to be successful. One of the important pieces of advice was that to make it to the South Pole I had to do two things. 1 Take care of myself. I had to avoid injury and do those things needed to keep myself alive. They gave me a lot of information on how to do this. 2 Keep moving south. It should be possible to get to the end as long as I kept going. After I finished and returned to the base camp I was talking with Tim. He told me that when I got into the interior and was still not getting enough miles they were worried that I would not make it. But I kept the two things he had told me in mind. I worked very hard to avoid injury, and I kept moving south. Sometimes those two things were in conflict and I had to decided which would override. But in the end the key to getting there was exactly that, take care of myself, and keep moving south. In case you didn't catch that with how many times I have said it, if you want to be successful you need to take care of yourself, and keep moving towards your goal.